Fun with Fox's "Mental Samurai"
Mental Samurai hosted by Rob Lowe debuted last night on Fox. Joey Gutmann: http://www.j-archive.com/showplayer.php?player_id=8131 played and did not make it through the 12 questions. Sam Durbin (morbeedo would love him) made it through the 12 questions to win $10,000 and the right to face the Circle of Samurai. 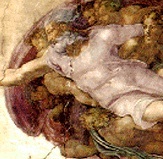 His remaining 13.31 seconds from the original 5-minute clock were added to the 1:30 (90 seconds) available to navigate the last four questions. 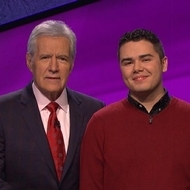 Sam got the first question right (Nile not Mississippi flows south to north) to add $15,000 to his $10K already won. Sam got the second question right in remembering a name to match a corresponding face from a shot of four gentlemen. 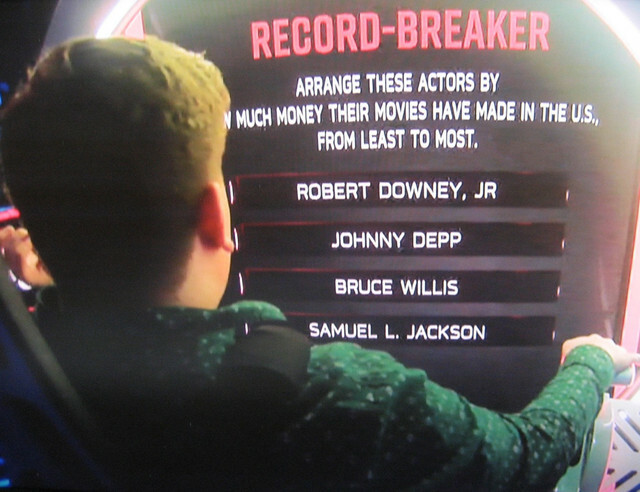 He missed with Jackson, Willis, Depp, Downey when the correct order was Willis, Depp, Downey (Marvel) and Jackson (Star Wars). The top players will come back on the last show to play for more money. The game is way too fast and crazy for Joe & Jane America to follow. For J! people the play-along factor is easy and there are a few trivia nuggets hiding in the mix. It's worth watching to see if it is your thing and as always I like seeing J! & Millionaire people again. Former MLB pitcher Donovan Hand was a contestant as well. Last edited by MarkBarrett on Wed Mar 20, 2019 4:32 pm, edited 1 time in total. I wrote this show off as soon as I saw the moving contraption they put the players in. I would definitely throw up just from watching this show, but now you’ve piqued my curiosity. The giant robot arm moving contraption is Ava. Seriously. Let's see. Standard corny reality show contestant intros? Check. Mostly "meh" trivia? Check (though the memory questions at least mixed it up a bit). An utterly useless gimmick, which seems to exist solely to waste 8-10 seconds between questions while it spins around? Check. It had more actual trivia content than I was expecting, I'll give it that. In the future, pass. I got them all right, but Depp and Willis were closer than I thought. I'm paying keen attention to this show since I made the final casting cut, but they rescinded my invitation once I let them know that I knew one of their research assistants from my attendance at TCONA. My only misses tonight were in Memory: Joey's bowlers and Becky's boxing announcement. The bowler miss was legitimate; I would have gotten the boxing one right had I not gotten distracted right as the announcement started. I'm a bit surprised at how mild the thrill ride part of the game has been. They really played that up in the interview process. The only person that I recognized was Heather Hurley, who appeared on the opening credits and is probably going to be on a later episode. This show doesn't seem hard at all, at least when you are at home. Much like 500 Questions where it has been dubbed the World's Toughest Quiz, although the questions weren't very hard at all. The word puzzles are very easy compared to the ones from the UK series "Hive Minds", and the memory puzzles are pretty easy compared to the ones on Krypton Factor. Not to mention, the difficulty of this show in general is NOTHING compared to "Genius Junior". However, this show is very pressure inducing when you are on the set in front of a large audience. Last night, there was a former astronaut, a former MLB player, and a drag queen. Overall, this is a great show. My only miss on the night was the Billboard #1's sequence question. I overthought it since that's kind of a wheelhouse for me. I thought Beyonce had a bunch more #1's, but it should have been obvious based on where we were in the game that the answer was going to be straightforward. Ken was really good. It stinks that he got stymied by a question about a very recent musical act. Bennett got lucky on the chair/chalk alphabetization. It sounded like he was treating chalk as though it started with "cl." Heather was great. I'm glad she didn't get fooled by "left hand" on the pin juggling memory question. Ken knew he had an Achilles heel and the show found it. Yes, too bad. I wanted to see more of his game collection. I've updated Heather's J! page: http://www.j-archive.com/showplayer.php?player_id=11496 and I expect to update it again at the end of the season. The pattern seems to be a couple of so-so players, at least one sob story, a good player who get close, a montage of quick and dones and one better player who makes money. The fast forward is a friend for sure when watching. What an easy gig for Rob Lowe. Huh. So our Brandon beat a certified genius. You still don't have her $60,000 win from The Chase in 2013-08-06 like you do on Jonathan Corbblah's page. Done. Thanks. Sorry, I don't have all the contestants from The Chase memorized. Let me know if Cory ever gets on J! or if he's already appeared. I watched her segment online earlier this week. She did a fantastic job, and it was great to see her do so well (the question she missed on was a heartbreaker, especially hearing her figure out the answer out loud right before). I was really rooting for her, something I may have not have been doing a whole lot of a couple years ago. Since I only watched her play, I can't make a big judgment on the show overall, but I liked what I saw. Rob Lowe is fun (his "good luck" and general encouraging attitude reminds me of his role on Parks & Rec -- and it is wonderful), and there was a good amount of suspense, at least for me. Don't know if I'll watch again if there's not someone I know of that's playing, but it wasn't a bad way to spend a few minutes. One contestant gave up because they didn't know who the third photo was to get his initials. You didn't have to know that one the first two were enough, I only know one U.S. capital that starts with "ALBA"
Another spent the entire time on his second question, a picture puzzle he said the answer to four or five times but never locked in because he didn't recognize it.